Time once again for the Dividist to stroll down our metaphorical beach and take note of the detritus that has washed ashore and cluttered this little island of rationality in the great big blogospheric ocean. ITEM - USA Today poll: Divided government is the "new normal"
"The sharp political divide that Americans say they hate may be becoming the new normal. A USA TODAY/Bipartisan Policy Center poll taken this month, the fourth in a year-long series, shows no change in the overwhelming consensus that U.S. politics have become more divided in recent years. But sentiments have shifted significantly during the past year about whether the nation's unyielding political divide is a positive or a negative. In February 2013, Americans said by nearly 4-1 that the heightened division is a bad thing because it makes it harder to get things done. In the new poll, the percentage who describe the divide as bad has dropped by nearly 20 percentage points, to 55% from 74%. And the number who say it's a good thing — because it gives voters a real choice — has doubled to 40% from 20%. Now, Americans say it's more important for their representative in Congress to stop bad laws than to pass new ones. On that, there is no partisan divide: 54% of Republicans and 51% of Democrats say blocking bad laws should be their priority." The Dividist has new confidence in the collective wisdom of the American electorate. There is nothing like the implementation of truly bad legislation passed on a 100% partisan basis to make people question the value of a unified single party government and a "Do Something" Congress. I am looking at you ObamaCare. "USA Today proclaimed in a front-page headline last week that Americans are not all that upset the federal government is functioning at a dead slow pace. “More Americans say polarization in Congress is good,” the newspaper proclaimed. The 24/7 news cycle and rise of cable news shows has created an atmosphere where advocacy takes precedence over reporting. As a result, it is difficult to sustain a thoughtful discussion on challenging issues that allows movement toward compromise and consensus. And without consensus and compromise, you cannot in our divided government make progress." Gregg makes some good points, but overall his op-ed is a bit of a confused mess. Blaming cable news is a canard and his shots at the President are misplaced. You can blame the President for the failure to do big things under divided government, but the administration's conventional and expected liberal "class warfare" posturing is not the problem. The real problem is that President Obama did not learn the lesson of Bill Clinton and Ronald Reagan on how to do big things in a divided government. The lessons of Reagan and Clinton are clear. The way for a president to do big things in a divided government is not to stand firm against the opposing party. The way for a president to do big things in a divided government is to stand firm against his own party. "As the 2014 midterms are approaching, the latest Reason-Rupe national poll finds 40 percent of Americans plan to vote for the Democratic candidate running in their district while 36 percent plan to vote Republican. However, when asked which party they want controlling Congress, a strong plurality (43 percent) opted for neither Republican nor Democrats to control government. With neither major political parties controlling Congress, divided government and hence gridlock would continue... While millennials would vote similar to older cohorts on Election Day, if given the choice 54 percent would actually prefer neither party to control Congress, 31 would favor Democratic control and 11 would opt for Republican control... Among independents—the group often used as a barometer for the median voter—fully 60 percent want neither the Democrats nor Republicans to control Congress." Pretty smart these Americans. In this poll Reason does a much better job of framing congressional party preference question than does Gallup, as the Dividist discussed earlier this year. Which, as it turns out, is pretty much exactly how the Reason-Rupe poll asked the question. You are welcome, Reason-Rupe. In some elections, notably the midterms, only one of the two alternative question/answer sets exist as a possible outcome. For example, in 2014 the only choice for voters is between Divided Government and Unified One Party Democratic Rule. Which is to say - there is only one real choice. ITEM - David Frum has a question. If GOP wins the Senate, then what? "Democratic hopes for 2014, never good, are fading fast. The New York Times reported on the mood of panic among Democratic senators. Forecaster Charlie Cook is speculating about a Democratic Senate wipeout. It's suddenly looking very possible that Republicans could regain control of both houses of Congress for the first time in eight years. What then? The main thing to expect: You're going to hear a lot less about debt and deficits from Republicans and a lot more from Democrats. 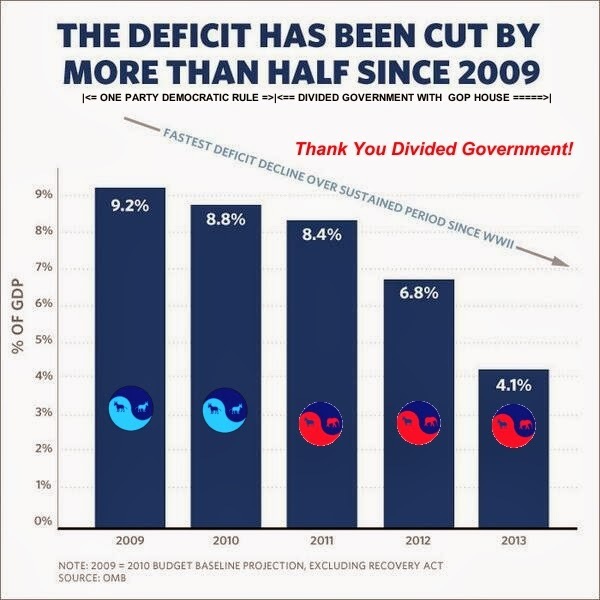 Deficit reduction is everybody's second favorite policy, after their first favorite, "Doing what I want." 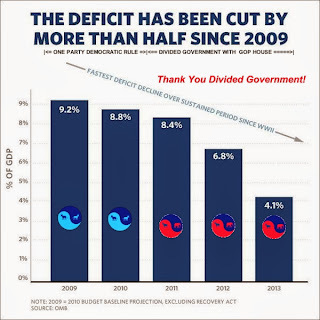 This may explain the seeming paradox that deficits tend to shrink during periods of divided government (like the final six years of the Clinton and Obama presidencies) and to widen during period of united government (like the first six years of the George W. Bush presidency and the first two years of Clinton and Obama). To put it even more bluntly: Deficits don't shrink because politicians reach Grand Bargains. Deficits shrink precisely when politicians are least able to do anything grand. Deficits shrink not when leaders compromise, but when they squabble." 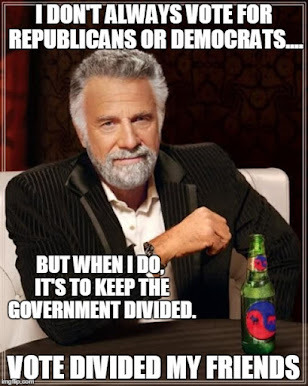 Divided government... FOR THE WIN! And to directly answer David Frum's question about what happens after the GOP takes majority control of the Senate in 2014... Well, if we want to continue to enjoy the fruits of divided government, then we may need to elect Hillary Clinton president in 2016. ITEM - George Will would rather see Democrats control the Senate than have Hillary Clinton for President. 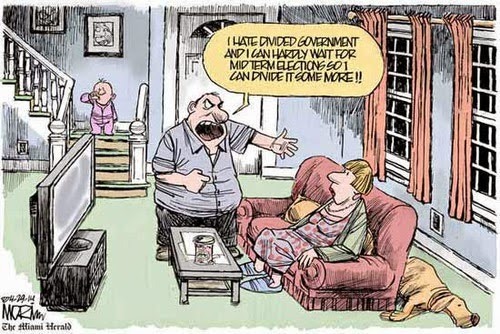 "Another sign that the American people aren't stupid is they've more often than not produced divided government. Imagine today if Republicans didn't control the gavels in one of the houses of Congress... If the Republicans should win the White House in 2016, there will be a real case to be made that good conservatives should want one of the houses of Congress to be in the control of the other party for precisely the reason Tom [Coburn] is talking about. If you think Republicans aren't capable of abusing power, you should have been here when he and I got here in 1970." Rest assured George, If the GOP take the Senate in 2014, the Dividist will be here in 2016 making exactly that case.